St. Marys is located just above Jacksonville, Florida – exit 1 as you enter Georgia from Florida. Known for southern hospitality and charm, the City of St. Marys was named #1 Small Town in Money Magazine. Use the links below to learn more about Historic downtown St. Marys, Big City attractions just 30 minutes away and more. Camden County is made up of 3 cities – St. Marys, Kingsland and Woodbine. 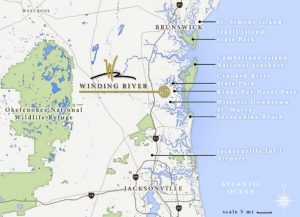 Winding River’s prime location allows for convenient access to major airports, I-95 and shopping centers, while being just far away enough to enjoy the quiet, small town like. Close to jobs, schools, shopping and transportation, Winding River is hidden off of Winding Road, but only minutes away from everything. St. Marys is the Gateway to Cumberland Island, the largest and southernmost barrier island in Georgia, offering 18 miles of white-sand beaches perfect for beachcombing. Catch a glimpse of wild horses, dolphins, sea turtles, shore birds and much more. Ferry boats run daily from downtown St. Marys. The Crooked River State Park is just down the road from Winding River and offers a great place to camp, fish, hike or launch your boat. The Okefenokee National Wildlife Refuge and its abundant activities are great day trip. Enjoy air boat rides and getting up close and personal with the wildlife. Kings Bay Naval Submarine Base is located in St. Marys and is the U.S. Atlantic Fleet’s home port for U.S. Navy Fleet submarines. This submarine base covers about 16,000 acres (6,400 hectares) of land, of which 4,000 acres (1,600 hectares) are protected wetlands. The base is home to many base subcontractors including Lockheed Martin, BAE Systems, Trident Refit and Training Facilities and many more.